I can remember back when I was a child growing up near New York's Chinatown. At that time, around 1954, there were four or five movie theaters in Chinatown that offered a new exciting Chinese Kung Fu movie each week. Chinatown movie theaters were quite different from American movies theaters. You could go in and buy Chinese food over the counter and have a small meal for yourself as you enjoyed the movie. The air would be filled with the scent of Chinese food and cigarette smoke. Chinese Kung Fu was new to me, having recently joined a school in Chinatown. I was fascinated with anything related to Chinese Kung Fu. The movies opened another world to me. I would sit, eating an egg roll, eyes wide open, watching every kick and punch the movie had to offer. Each fight was an experience - guys flying around seemingly by magic, whirling swords and strange looking weapons. They were the coolest looking weapons one could imagine. When they would fight hand to hand this strange beam of light would emerge from the palm of their hands killing the villain. I dreamed of the day when my teacher would teach me all this great stuff. I thought that after learning this stuff I could fly around my neighborhood and knock off all my rivals. I would be an untouchable master, lord of my block. How cool, I thought, as I left the theater eager for next week's movie and a new and exciting adventure that would both entertain and enchant me again. I was hooked on the fantasy of Kung Fu, not knowing the fantasy from the truth. But this is how they made movies in those days. The stories were taken from old legends, touched up by a good director and some special effects. Now, with more experience in the arts, I know what these moves are. In the inner circle this kind of movie is known as a "String Movie." It got its name from the fact the heroes and villains were hooked to ropes or cables and pulled through the air as if flying. While watching the movie you could actually see the ropes suspending the actors in the air, you had to try hard to forget they were there. It sure kills the fantasy fast. But as a young martial artist, a mere child at that, I was enthralled with the Kung Fu movies. 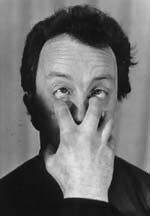 Master Chris Peck plays victim of an eye poke, above, and eye gouge, below. Today movies are more realistic, although I have seen some that still emphasize the fantasy rather than reality of Kung Fu. Still we have come a long way in movie making, as now they use real martial artists instead of stunt men and extras. Bruce Lee based his movies on realism rather then fantasy, and today Jackie Chan also shows true Kung Fu in his movies. Even though you are now seeing true Kung Fu, in one sense it is not. What you are seeing is the flowery part of Kung Fu, not the brutal non-showy movements. One of my teachers once told me, "Kung Fu technique is executed in a second, so there's not much to see, and what you do see, is not very pretty." This reminds me of an incident in my life. I was young, about five or six years into my study of the arts, when I got into a fight with a local tough guy. He came at me with arms spread wide apart as if to grab me. I remembered a technique my teacher showed me and applied the raising knee attack. This is better known to martial artist as "White Crane Stands On One Leg." This stopped the attack dead as the knee slammed home, hitting the attacker directly in the groin. A man standing nearby came to me and said, "It's ok to fight, but you should learn how to fight fairly, and stop hitting people in the groin." Even today groin strikes are forbidden in boxing. It's considered a dirty strike. However, to those in the martial arts the groin is a prime target. It is thought that hand to hand fighting started in Ethiopia around 6,000 years ago, then traveled to Egypt and through the Mediterranean area. Around 688 B.C. boxing was added to the ancient Olympics. In one form of Greek boxing the two fighters sat on a stone and commenced to beat each other till one opponent fell. The Romans fighters wore leather thongs which made the fighting even more brutal. They added hand wraps that had brass studs embedded so as to make the hand a deadly weapon. These matches resulted in the death of one of the combatants. Although punching was favored, the contestants could do just about anything to win the fight. Grabbing throwing and even hitting the opponent after he was down. Nothing was considered to be unfair. 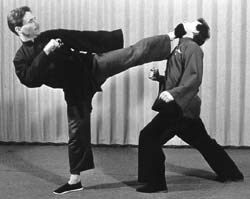 Paul Greenbaugh demonstrates a kick to the neck of Master Peck. Around 1719 James Figg, an expert fencer, opened a boxing academy. He took on all comers to prove his fighting skills. It is said he never lost a battle until his retirement in 1730 and he was crowned Great Britain's grand champion. His method was to add sparring and counter punching to his style. He took his inspiration from his fencing skills. One of Figg's students, Jack Broughton, took over where his teacher left off and became the next undefeated champion. He formulated the first set of rules known as "Broughton's rules" which tamed much of the brutality . Some of his rules stated you could not grab your opponent below the waist, although holding above the waist was ok. He also introduced boxing gloves, known as "mufflers". These were used during practice, but during the actual fights, it was back to bare fists. Broughton's rules also introduced the "no hitting when a man goes down" rule. Boxing history tells of some of the best fighters of the time, like Bill Richmond (1777), known as the "Black Terror" and Tom Cribb. The list goes on with other greats like Yankee Sullivan (1849), and Tom Hyer (1849), known as the "Great American Hope," John L. Sullivan (1882) and who could forget James Corbett, known as "Gentleman Jim." At this time new rules were introduced which came to be known as the "Marquis of Queensberry Rules". The fighting arts were again modified and the brutality of fighting was lessened. The Marquis rules stated there were to be no wrestling, or hugging. Gloves were to be worn. In general the rules stated that if a man looked like he were beaten to a point near falling down, the fight could be stopped. This helped insure that people would not be beaten to death in the ring. Today, boxing has even tougher protections for the fighters. So-called "dirty fighting" is now held in great disdain. American boxing evolved from the brutal fighting of the past to our modern sport, which is under strict control of various boxing commissions. Asian fighting grew out of different needs - to protect one self, and to defend one's country. Kung Fu is also considered an art form with ethics, but the rules for fighting are somewhat different. At the dawn of martial arts, sport was never the intent, as fighting was a necessary to stay alive. There were no rules of fair play. Even today the ethics of combat have not changed. It was and still is a killing art, a merciless art when forced into action. There are no Marquis of Queensberry rules. Anything that works goes: eye attacks, groin strikes, throwing, bone breaking, hitting with clubs, stabbing with knives, winging spiked chains at the opponent - nothing is prohibited. Paul Greenbaugh demonstrates a head bang against Master Peck. There is nothing pretty about someone having his eye gouged out, or groin ruptured, or back broken. These techniques were never meant to be tempered, but were meant to finish off the opponent as quickly as possible. It's a westerner's vision of dirty fighting at its worst. But over the course of time martial arts fighting took on a different view. This was brought about by the advent of the Shao-lin Temple in northern China. Here the monks used the Shao-lin martial arts as a means to further cultivate the body, to promote exercise, discipline, and focus. Killing was forbidden. A monk who would take a human life was considered doomed to suffer the karmic consequences of his act. This was against everything he trained for. So the martial arts skills became associated with the Shao-lin Temple, where the arts became a tool to cultivate the mind, body and spirit. But outside the temples walls the old way of fighting still prevailed. And those who were not monks found no problem with using their martial arts to fight to the death. Master Ch'ang Tung Sheng was such a man. His art is not fancy or flowery, but brutal and straight forward and to the point. And that point is: to take out the adversary quickly and permanently, if necessary. This is not to say that the classical Shao-lin styles should not be mastered. All moves and applications have their place in the martial arts arsenal. This is the fun of learning the martial arts. It is a challenge to our own abilities. Trying to master the various styles and techniques can be a very important part of learning. It helps us to recognize our strong and weak points. The truth of the matter is that many of the old styles were created during a different time, before guns were developed. Although there are such Kung Fu styles as the Turtle or the Frog, it is not likely you would use such styles today against a gun. You would more likely be using in-close techniques that are fast and fatal. From a distance, you would take cover and get away as soon as you could. Never forget, gun fighting and empty hand fighting are two different things. In my schools techniques against guns are only taught as a last resort. One mistake and a one-ounce bullet will take down a two hundred pound man. It was the gun that defeated martial arts in China. Today, the gun still reigns as king. With this in mind you should practice your martial arts with certain limitations in mind. Why Practice Martial Arts Today? This raises the question: why practice the martial arts at all if they are defeatable? The answer is, we practice the arts for other reasons than killing or being killed. We practice because the arts challenge our abilities, help us overcome our short comings, make us more alert, and, taken to its highest stages, can awaken a part of us we have never known. Shao-lin as practiced in the Shao-lin temple traditions is beyond killing. It is a way to harmonize the mind, body and spirit. Of course if I should have to defend myself in a normal unarmed attack I would have all I need in the way of useful Shao-lin techniques. Nothing in the Shao-lin Temple traditions says we can not protect ourselves against attack. In this sense the Shao-lin is indeed useful to know. I always tell my students to learn all they can in the way of techniques. You can never say what you will need at any given moment in an encounter. Even the movements of the Frog take on value, when the opportunity presents itself. It's not only fun to learn the techniques but also can be an eye-opening experience to learn all the possibilities of attack and defense. It is the game of mind control, fighting strategy, and physical skills that make Shao-lin so interesting and challenging. To develop these skills will keep you busy the rest of your life. You can see that there are a few different approaches to learning this marvelous art. You can learn the very beautiful Wu Shu aspects which stress grace and beauty of the moves rather then the effectiveness of the move in defense. Some may enjoy this style of martial arts for the exercise and body control. Then there is the more classical Shao-lin seen today, which stresses the effectiveness of the move for defense. Lastly there is the straightforward approach to defense. Here moves have nothing to do with how pretty they are, but rather how effective and uncomplicated they are. These are the good old dirty fighting techniques that are an intrinsic part of martial arts. These are the simple strikes that can stop a man cold in his tracks. 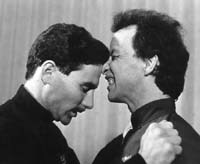 For example, in Taiwan that the noted martial arts writer Robert Smith, author of a number of fine martial arts books, went to interview Master Ch'ang Tung Sheng about his art form. To Mr. Smith's surprise Ch'ang greeted him with a firm slap to the groin. Smith remarked, this strike served to establish the lines of their relationship. Master Ch'ang must have sensed the need to use this technique to prove a point to Mr. Smith. Let's face it, there is nothing more eye opening, and breath taking, than a firm, well aimed strike to the private parts. My teachers often told me there are three way to stop an opponent: take his eyes, take his breath, or take his ability to stand up. These are the three canons of martial arts. Low kicks to the knees and groin are very hard to stop. The eye strike will stop the best fighter in his tracks. Of course these strike are used with great reservation. That is why a true martial artist does not want to fight, for if he fights he may be forced to use one of the three techniques, thereby really hurting his opponent seriously. Hurting people is not the prime directive of a true martial artist. A Shao-lin practitioner would always rather avoid a confrontation than get into one. My teachers often pointed out that it is an easy matter to fight. Just go out onto the streets and look for a fight and before you know it you will have one. The idea is to avoid as many fights as possible in one life. This is the sign of a master. Fighting never proves anything except who is stronger in battle. It says little about who is right and who is wrong. A true Master will find other ways to settle confrontations before it gets to actual fighting. Fighting should always be the last way, when all other doors of escape are closed to you. To conclude, I've tried to show you some of our own history of boxing and just how cruel it was in its early beginnings. It was only tempered over the course of time to become one of our major sports. But the martial arts have remained much the same from generation to generation. Although it has branched into many varying styles over the centuries, the core of the arts remains much the same today as it did during the time of the Yellow Emperor: effective, strong, and the best "dirty fighting" known to man.